Hey so this is my first blog post. We are here at the Manna house in Solola, Guatemala. So far I have been having the time of my life. From going to Carlos’ house for lunch and talking to him about a great number of things in Spanish, to working with the 4 and 6 year old kids in the “Parvs” class and teaching them about the gusanitos who get you sick, every part of this trip is going to impact my life. Just recently, we got back from San Marcos, after staying in a Hostel and enjoying the bugs near and on our beds. 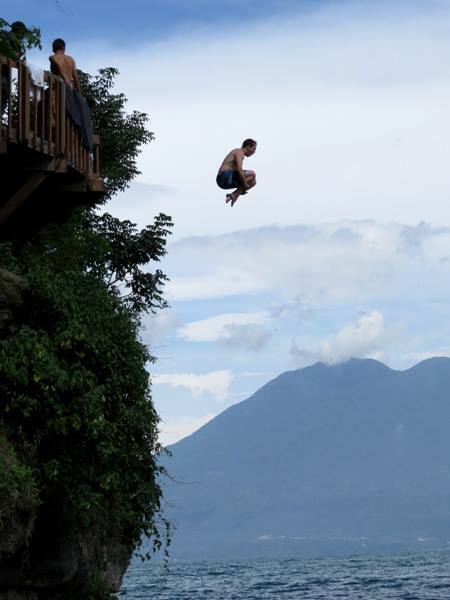 The park where we kayaked and swam was amazing though and we got to jump off of the “trampoline” into Lake Atitlan. The jump was close to 7 meters high and I remember thinking right after I jumped: “why haven’t I hit the water yet! Oh my gosh this is higher than I thought”. It was a once in a lifetime experience and I am so glad that I got the chance to do it. While kayaking, I was the only one to tip my kayak and have to get back in out in the middle of the lake. I guess I deserved it however because I was splashing my fellow kayakers. The whole weekend trip was so great and the food was awesome as well. Since we got back, we went to the bottle school/fathers’ day ceremony at Central in Chaq. That was an interesting experience and even though we were there for close to 5 hours, the lunch we got was great, with tamalitos and soup which got all over my pants. The whole ceremony was sweet and Jess got to say quite a few words about Manna and what it is that we do here and hope to accomplish. Everett got stung in the lip by a bee, but what surprised me was how a random man offered honey candy to sooth the pain, and everyone was very helpful in the whole situation. This was nothing compared to Ja when she broke her ankle and how random people stopped their cars and offered to help too, but it was still similar. This is one thing that I appreciate so much about this place, how much kindness there is and how people truly care about others. It is nothing like that back in the states and this experience will stick with me forever. I love every second, and thank Manna so much for this experience.